A four-hour direct flight from Boston brings you to this string of volcanic islands, and transports you to an altogether other world. TWIN DELIGHTS The side-by-side lakes, one green, one blue, called Sete Cidades are a must-see on the Azorean island of Sao Miguel. AT THE END of my first day on Sao Miguel, after racing to glimpse half a dozen of the island’s spectacular mountains, lakes, and beaches before a helmet of fog settled down over them, I came across an arresting sight. In Mosteiros, a small village of red-roofed, whitewashed houses on the island’s northwestern corner, the mauve sunset collided with the blue ocean to frame a set of rock formations standing sentinel just offshore. It looked a bit like a Stonehenge of the sea. 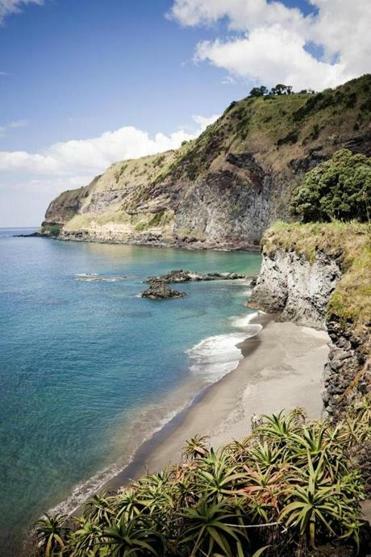 In every guidebook for the Azores — a string of nine volcanic islands sitting in the wide-open Atlantic between New England and Western Europe — there is a checklist of not-to-miss sights. It’s a testament to the bounty of Azorean beauty that on the lists I had consulted, this gorgeous scene in Mosteiros was nowhere to be found. Before I became too enamored, Pedro Pavao, the 36-year-old native who was showing my wife and me around, offered some perspective. “Wait until you see Furnas tomorrow,” he said. “What makes that place so special?” I asked. The Azores just might be the most interesting destination you’ve either never heard of or never seriously considered. It’s something of a mystery why more New Englanders don’t visit the archipelago, which functions as an autonomous region of Portugal. It’s not because of inconvenience. Boston is the only American city offering year-round nonstop flights to Sao Miguel, whose population of nearly 140,000 exceeds the combined total inhabitants of the eight other islands. And the flight there takes only about four hours. Yet the Americans filling the seats tend to be those of Azorean heritage. Unaffiliated tourists exploring the islands are more likely to come from Europe than the States. The Azores just might be the most interesting destination you’ve either never heard of or never seriously considered. It’s something of a mystery why more New Englanders don’t visit the archipelago, which functions as an autonomous region of Portugal. CAN’T MISS Ponta Delgada’s downtown is immaculate. grandeur in comparison with the natural wonders of the world? Or in comparison with the view of a boarded-up factory and coughing coal plant on the banks of the Taunton River? Waiting at the gate at Logan in January, listening as an airline agent rattled off a list of passenger names that could have doubled as my high school homeroom roster — Arruda, Cabral, Correira, Souza — I knew it wouldn’t be long before I finally got my answer. THE OLD-TIMERS were speaking the truth. We arrived to find a European outpost that called to mind the exotic landscape of Hawaii, the lush green of Ireland, and the eclectic cuisine that comes from blending local fish, meat, and produce with Portuguese traditions and the varied spices collected through six centuries of seafaring. Because our stay was in the offseason and short — we left late Friday night and flew back late Tuesday afternoon — we scrapped our plan to do a little island-hopping and instead stuck to Sao Miguel. It turned out to be the right choice. Sao Miguel is not only the biggest and most populous of the islands, it also boasts enough natural attractions to keep you busy for at least a week. We stayed at Hotel Marina Atlantico (011-351-296-301-880, bensaude.pt/hotelmarinaatlantico/en/), a nice place on the water in the capital city of Ponta Delgada. Doubles there are going for about $130 a night, though there are plenty of options at lower price points. As much as the Azores have to offer, there are a few drawbacks. The weather is reliable only in its unpredictability. “All four seasons in the same day,” the locals joke. Temperatures average 55 degrees in the winter and 73 degrees in the summer, though we were fortunate during our stay to see lots of sun and temps hovering around 60. But when the clouds roll in, they can bring heavy rain and fierce winds that make it next to impossible to take in all that the islands have to offer. Also, tourists expecting to find the white-sand beaches of the tropics or to be greeted by broad, welcoming smiles will probably be disappointed. Beaches are attractive but generally rugged. Sunbathing naturally takes a back seat to hiking, watersports, whale watching, and other activities that leverage the power of all those unforgettable vistas. As for the locals, they might seem reserved or even a bit distant. 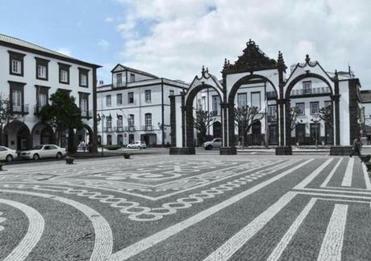 Walking through the handsome, immaculate downtown of Ponta Delgada and smaller cities, we weren’t met with many smiles. But Azoreans have their own kind of friendly, and it’s one that Bostonians will understand well. Once you penetrate the veneer, you often find incredibly warm and giving people who are immensely proud of their corner of the world. A minute after we walked into a store asking for directions to an obscure street in Ponta Delgada named in honor of Fall River, the shopkeeper enlisted the help of his father, who promptly got on the phone with the post office to find an answer for us. And then there was Pedro’s family. After lunch on Day 1 in Sao Miguel, I dialed the number my parents had given me. I didn’t know Pedro, but my parents are friendly with the wife of his father’s cousin in Fall River. I hoped he might be able to offer a few insider tips for making the most of our brief stay. Instead, he and his family took turns shepherding us around the island. They treated us like their long-lost relatives. By the end of our time there, that’s exactly what they felt like to us. Of course, you can travel around Sao Miguel just fine without the help of locals. It’s very safe, many people speak English, and, thanks to the infusion of EU cash, it’s got lots of new highways and other modern infrastructure. On that first afternoon, our stops included Lagoa do Fogo (“Fire Lake”), a gorgeous blue lake sitting in a volcanic crater rimmed by green mountains; Santa Barbara Beach, whose monster waves have turned into a favorite for serious surfers; and the island’s most famous attraction, Sete Cidades, a high-elevation spot overlooking a pair of side-by-side lakes, one green and one blue. It was voted one of the seven natural wonders of Portugal. The only problem was that clouds and dense fog had beaten us there, choking out the famous view. Still, the skies cleared in time for that memorable sunset in Mosteiros. 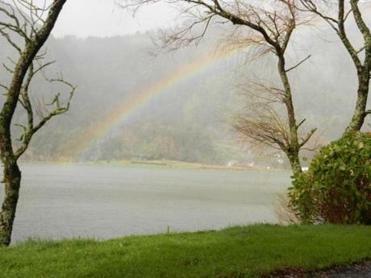 LAKE EFFECT SHOW A rainbow forms over Lagoa das Furnas, a volcanic crater lake on Sao Miguel. Day 3 was just as jam-packed, with a return to Fire Lake for a long hike down the caldera, visits to one of the island’s many greenhouses where pineapples are grown and to one of Europe’s two remaining commercial tea plantations, and then an exploration of the north and northeast coasts. But, just as Pedro had predicted, Day 2 was the one we would never forget. FURNAS IS A MAGICAL PLACE. Known for its hot springs, it’s a verdant village that hugs a light bulb-shaped lake sitting inside the rim of a volcano that last erupted in 1630. Everywhere you look there are fumaroles, those openings in the crust of the earth where steam and gases pour out. They are unmistakable reminders that you’re standing on a volcano, and they make the center of the earth feel a whole lot closer than it really is. There’s something even more remarkable about Furnas. It’s the only place I’ve ever visited that somehow manages to satisfy all five basic senses. First: sight. As we drove through a valley that’s lush even in the dead of winter and made our way to the lake, the morning’s light rain began to let up and we could see fumarole steam rising from the shore. As if it didn’t already look like a Hollywood set, an enormous rainbow appeared on cue, stretching from the lake up into the sky. As we walked along the shore, we got the next sense: hearing. We could detect bubbling underground. It was a byproduct of the process by which surface water seeps below the earth’s surface, comes into contact with boiling areas around magma reservoirs, and then rises back up through surface cracks and fissures. Then came the third: smell. That natural steam, which rises out of pits that have been dug into the hot earth to turn the fumaroles into underground ovens, gives off the powerful scent of sulfur, like a burned firecracker. Those ovens would become key to satisfying our sense of taste, but we’d have to wait for that one. We headed to a restaurant in the village called Caldeiras & Vulcoes (011-351-296-584-312, facebook.com/caldeirasevulcoes). There, we met up with Paulo Costa, a 26-year-old chef whose family opened this restaurant in 2011 on the floor above its longtime pub. He guided us through the preparation of the cozido-das-Furnas, a signature Azorean medley of meats (beef, chicken, pork, pig ear, pig feet, pig leg), sausages (chourico and blood sausage), and vegetables (cabbage, kale, carrots, sweet potatoes, garlic, potatoes, taro, and onions). Over nearly seven hours, in one of those natural ovens by the lake, the power of the hot springs would turn all that raw meat and produce into a tender, flavor-packed dish. We returned to the lake, this time with Paulo and his cozido pot on a rope, and watched as he lowered it into the ground and covered it with volcanic sand. Tourists eating at other restaurants in town also came to watch their meals meet their maker. While ours cooked, we had a fourth sense to attend to. The village overflows with natural attractions. There are enormous hot springs that are stunning (though dangerous if you get too close). And there are numerous fountains where you can sample water from various mineral springs, each one with its own distinctive taste. But for the true sense of touch, we headed to Poca da Dona Beija, where we felt the therapeutic rejuvenation offered by a geothermal pool. (The fee was a reasonable two euros, which helped explain why there were more locals there than tourists.) We stayed comfortably warm wearing only bathing suits. Outside the water, however, the mercury had plummeted, as evidenced by the woman sitting on the bench near the pool, bundled up in her winter coat. We headed back to the lake with the young chef to retrieve the cooked cozido. In his restaurant dining room, we finally arrived at the fifth sense: tasting the meal that the earth had cooked for us, accompanied, naturally, by local mineral water. If we had left Boston and taken our four-hour flight west, we might have ended up in Las Vegas, where every sight and sensation is 100 percent fake. Instead, we had flown east for four hours and found a place where absolutely none of the magic is man-made. 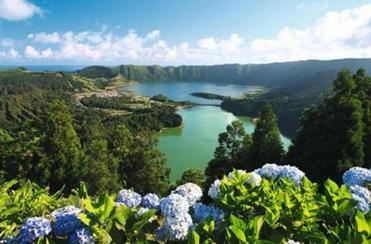 The airline SATA (508-677-0555, sata.pt) offers nonstop flights from Boston to Ponta Delgada, Sao Miguel. Flights are now available on Tuesdays, Thursdays, and Fridays; Mondays will be added June 3 and Saturdays June 29.